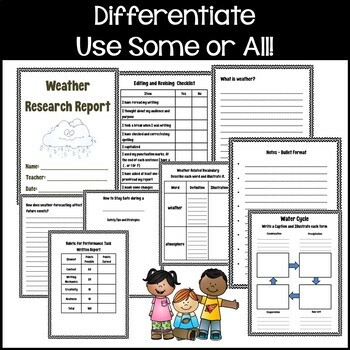 Engage your students with this fun and comprehensive Weather Research Report resource. It helps make report writing easy! 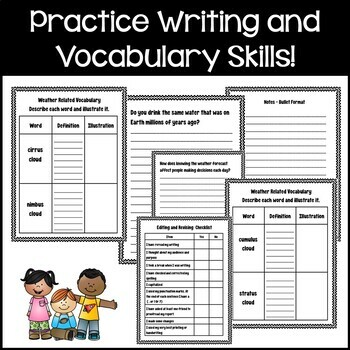 It contains vocabulary, worksheets, questions, organizers, tools and forms to use for your students to create, develop, write, edit, illustrate, present, and assess your students’ Weather Research Report. Students LOVE to study weather! 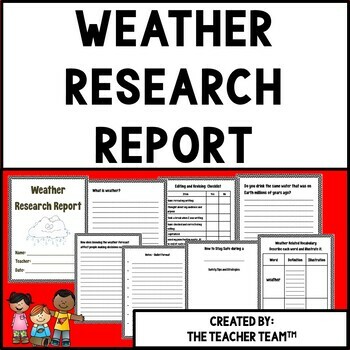 This is a fun, 40 page resource to help your students produce a research report on Weather. This report template contains worksheets, organizers, tools and forms to use for your students to create, develop, write, edit, illustrate, present, and assess your students’ report. This report is also designed to not only to learn and explain the new information, but answer some higher level thinking questions (Common Core Essential Questions) to apply the knowledge they have learned. You can use this report template in its entirety, or “pick and choose” the questions that you wish to use and tailor it to your students’ needs. created gray-scale version if you can’t copy in color. 3. Define and illustrate weather-related vocabulary words. 4. Write a caption about each phase of the water cycle. 5. How is weather and the water cycle inter-related? 7. Do you drink the same water that was on Earth millions of years ago? 8. What causes different kinds of weather? 9. What is the difference between weather and climate? 10. How does weather forecasting affect future events? 11. What kind of extreme weather is the most dangerous and why? what can be done to help these areas that don’t have enough water? 13. How are plants and animals affected by the weather? be a major storm, flood, drought, or something else weather related. weather event (student choice- they choose which type of extreme weather). pieces of colored paper and glue them down into a collage. 17. 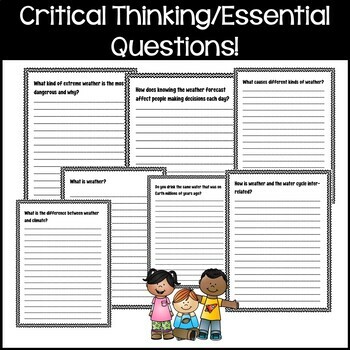 Blank paper to add to any of the questions if more room is needed.